Epson today announced a new large-format photo ink-jet printer, the Stylus Pro 3880. The printer has a price of $1,295. A Graphic Arts Edition, which includes a ColorBurst raster image processor, is available for $1,495. The 3880 uses Epson’s UltraChrome K3 Vivid Magenta pigment ink set, which uses new magenta and light magenta inks. The printer uses eight individual ink cartridges, including three different black ink cartridges (Photo or Matte Black, Light Black, and Light Light Black). 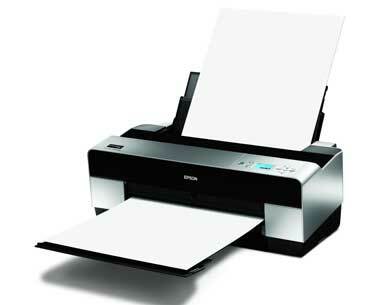 The printer uses a technology called AccuPhoto HD2, developed by Epson and the RIT Munsell Color Science Laboratory. According to Epson, AccuPhoto HD2 helps produce smoother-looking images and more-consistent colors. The 3880 has a maximum resolution of 2,880 by 1,440 dots per inch and supports cut-sheet media as large as 17 by 22 inches. The printer also supports different artistic media, such as Ultra Premium Photo Paper Luster, Premium Photo Paper Glossy, Exhibition Fiber Paper, Enhanced Matte Paper, Velvet Fine Art Paper, Premium Canvas Matte, and more. Connectivity features include USB 2.0 and ethernet. The printer does not have memory card slots or PictBridge. The 3880 will be available in October.